Somebody in the pay phone business has a sense of humor. I guess if you are still in that business you need a sense of humor. 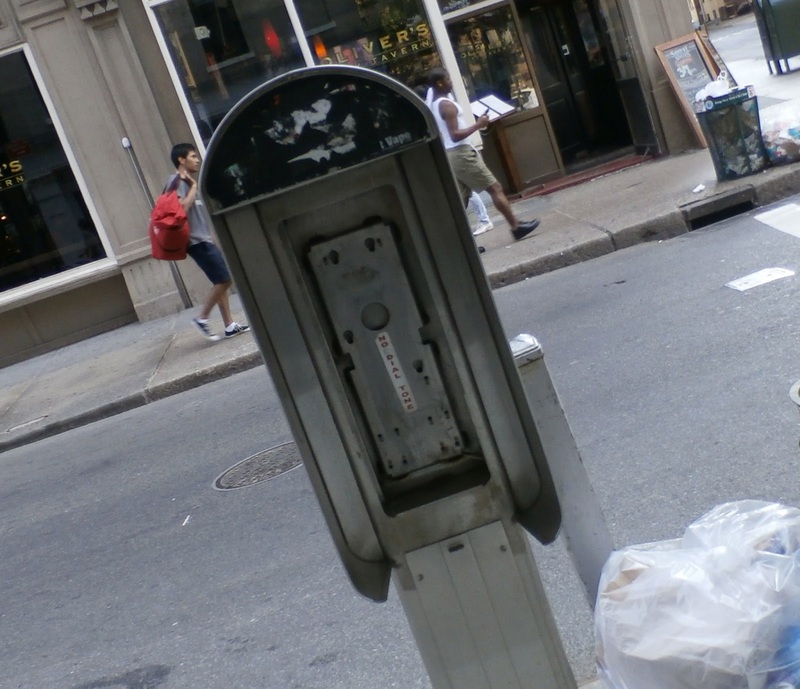 The personnel who collect the change from the pay phones put the No Dial Tone stickers on the receiver to notify the maintenance crews who still fix pay phones what the problem is. Apparently they came to this open phone kiosk and the pay phone was already gone – some have been designated to be removed, others will stay for emergency use when a cellphone malfunctions or by those smart enough to have realized that our wireless culture is increasing conformity and aliens are using your smart phone to insert those voices you are hearing in your head. 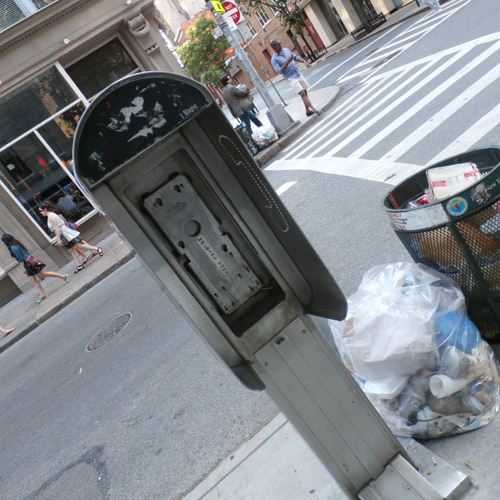 I think these individual pay phones are a newer species of this old technology. The older open booths were being maintained because they still provide some easy to ignore street advertising. No advertising here. The battery is dead in my cellphone and I have to call 9-11 and report a crime. 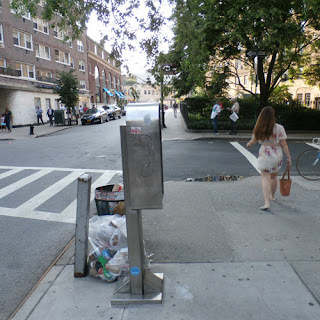 There’s a pay phone shell at the corner – what! It’s gone! Only sarcasm remains. 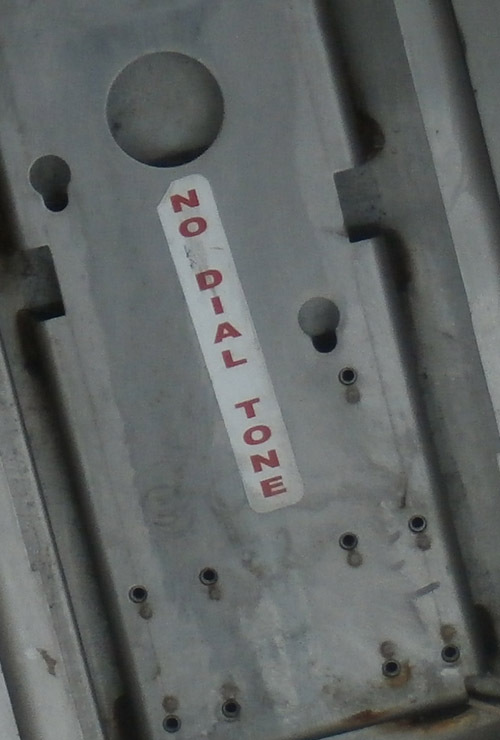 No dial tone and no phone is the same as no dial tone and a phone and probably preferable tot dial tone and no phone. Live goes on in this neighborhood; the existence of a phone or not, a dial tone or not, matters not to everyone here, going about their business, living their life. But when you are here and you need a pay phone nothing else in life is as important as that dial tone.